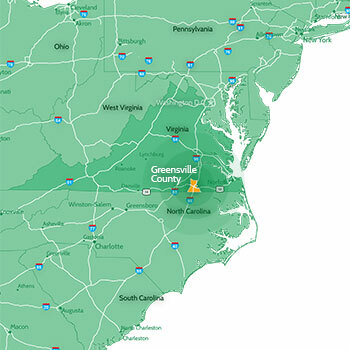 Located in southern Virginia, Greensville County is a 300-square mile area just north of the North Carolina border surrounded by Brunswick, Dinwiddie, Sussex, Southampton, and Northampton counties. Rich with rolling landscapes, rivers, and lakes, Greensville County is directly connected to the entire eastern seaboard by interstate highway and rail service. This positions the County along the valued I-95 corridor within easy access of large metropolitan areas like Raleigh, Richmond, and Norfolk. Greensville is an ideal middle ground for thousands of travelers on I-95, as well for those heading to the coast on US 58, providing the county with strong economic ties to the travel industry.